The Senegal national football team, nicknamed the Lions of Teranga, is the national association football team of Senegal and is controlled by the Senegalese Football Federation. Le Havre Athletic Club is a French association football club based in Le Havre, Normandy. The club was founded as an athletics and rugby club in 1872. Le Havre plays in Ligue 2, the second level of French football, and plays its home matches at the Stade Océane. Espérance Sportive Troyes Aube Champagne is a French association football club, based in Troyes, who play in Ligue 2. It was founded in 1986, as the third professional club from the city, after ASTS and TAF. They won the Intertoto Cup in 2001, beating Newcastle United on the away goals rule after the score was 4–4 on aggregate. Ligue 2, also known as Domino's Ligue 2 due to sponsorship by Domino's Pizza, is a French professional football league. The league serves as the second division of French football and is one of two divisions making up the Ligue de Football Professionnel (LFP), the other being Ligue 1, the country's top football division. Contested by 20 clubs, it operates on a system of promotion and relegation with both Ligue 1 and the third division Championnat National. Seasons run from August to May, with teams playing 38 games each totalling 380 games in the season. Most games are played on Fridays and Mondays, with a few games played during weekday and weekend evenings. Play is regularly suspended the last weekend before Christmas for two weeks before returning in the second week of January. Football Club de Metz, commonly referred to as FC Metz or simply Metz, is a French association football club based in Metz, Lorraine. The club was formed in 1932 and plays in Ligue 2, the second level in the French football league system. Metz plays its home matches at the Stade Municipal Saint-Symphorien located within the city. The team is managed by Frédéric Antonetti. In their 85 year history, Metz have spent 60 seasons in Ligue 1 and 17 seasons in Ligue 2. They have won the Coupe de France twice and the Coupe de la Ligue twice. Jean Fernandez is a football manager, who is currently the manager of Qatari side Al-Khor. He has previously managed FC Metz and Marseille, where French national team star Franck Ribéry saw him as a mentor. He managed AJ Auxerre for five years, and was named as France's manager of the year in the 2009–10 season after guiding Auxerre into the UEFA Champions League. He managed Nancy for the 2011 season and half of the 2012 season. Jean Fernandez resigned from his position with Nancy before the end of the 2013 season on 10 January 2013. He became the new Montpellier manager on 1 July 2013, but departed on 5 December that year after a run of seven games without a win. Racing Club de Strasbourg Alsace is a French association football club founded in 1906, based in the city of Strasbourg, Alsace. It has possessed professional status since 1933 and is currently playing the 2018–19 season in Ligue 1, the top tier of French football, after winning the 2016–17 Ligue 2 championship. This comes after the club was demoted to the fifth tier of French football at the conclusion of the 2010–11 Championnat National season after going into financial liquidation. Renamed RC Strasbourg Alsace, they won the CFA championship in 2012–13, and eventually became Championnat National champions in 2015–16. Danijel Ljuboja is a Serbian retired professional footballer who played as a forward. Mickaël Pagis is a retired French football striker and currently a beach soccer player. The Coupe de la Ligue, known outside France as the French League Cup, is a knockout cup competition in French football organized by the Ligue de Football Professionnel. 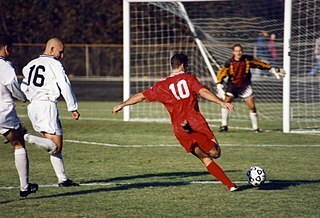 The tournament was established in 1994 and, unlike the Coupe de France, is only open to professional clubs in France which play in country's top three football divisions, though only four professional clubs currently play in the Championnat National. The Coupe de France, also known as the Coupe Charles Simon, is the premier knockout cup competition in French football organized by the French Football Federation (FFF). It was first held in 1917 and is open to all amateur and professional football clubs in France, including clubs based in the overseas departments and territories. Between 1917 and 1919, the competition was called the Coupe Charles Simon, in tribute of Charles Simon, a French sportsman and the founder of the French Interfederal Committee, who died in 1915 while serving in World War I. The final is played at the Stade de France and the winner qualifies for the group stage of the UEFA Europa League and a place in the Trophée des Champions match. A concurrent women's tournament is also held, the Coupe de France Féminine. Olympique Lyonnais won Ligue 1 season 2005–06 of the French Association Football League with 84 points. Abdel-Kader Keïta is an Ivorian professional football player who played as a winger. Keïta represented the Ivory Coast national football team from 2000 to 2012. Al-Sadd Sports Club is a Qatari sports club based in the Al Sadd district of the city of Doha. It is best known for its association football team, which competes in the top level of Qatari football, the Qatar Stars League. Locally, it is known primarily by the nickname "Al Zaeem", which translates to "The Boss". In addition to football, the club has teams for handball, basketball, volleyball, table tennis and athletics. It is the most successful sports club in the country, and holds a national record of 53 official football championships. Lee Jung-soo is a South Korean footballer who plays as a central defender for Charlotte Independence of the USL. Olympique Lyonnais won Division 1 season 2001/2002 of the French Association Football League with 66 points. The title was decided in the very final game of the season when Lyon defeated erstwhile championship leaders Lens at Stade Gerland. Lyon had to win the match to take the title, and won 3–1, ending Lens's title dream. It was Lyon's first league championship, and it began their record seven successive league titles. The 2000–01 Ligue 1 season was the 63rd since its establishment. FC Nantes won the French Association Football League for the eight time with 68 points. The 1999–2000 Ligue 1 season was the 62nd since its establishment. AS Monaco won the French Association Football League with 65 points. The 1998–99 Ligue 1 season was the 61st since its establishment. FC Girondins de Bordeaux won the French Association Football League with 72 points. The 1996–97 Division 1 season was the 59th since its establishment. AS Monaco won the French Association Football League with 79 points. Four teams were relegated to Second division and only two were promoted because in 1997–1998, only 18 would participate the championship. FC Nantes won Division 1 season 1994/1995 of the French Association Football League with 79 points and only one defeat. Henri Bienvenu Ntsama is a Cameroonian footballer who plays for Al Urooba as a striker. Gérald Baticle, is a former French football striker and current manager. The 2009–10 Coupe de la Ligue was the 16th edition of France's league cup, organized by the LFP. The defending champions were Ligue 1 club Bordeaux who defeated second division club Vannes 4–0 in the 2009 final. The competition began on 25 July 2009 and the final was held on 27 March 2010 at the Stade de France. The winners of the Coupe de la Ligue will qualify for the third qualifying round of the UEFA Europa League 2010–11. Ligue 1 club Marseille won the competition by defeating fellow first division club Bordeaux by a score of 3–1 in the final, thus giving them their first trophy since 1992. Olympique de Marseille extended their titleless run to 15 years – but had a decent season, where they qualified for the UEFA Champions League for the second year running, and won away from home in the 2007–08 tournament at Anfield against 2007 finalists Liverpool, but a 4-0 defeat at Stade Vélodrome in the last round knocked l'OM out of the tournament. Having sold Franck Ribéry to Bayern Munich for around 30 million euros, the stage was set for Marseille to push the boundaries financially in the coming seasons, with investments in the playing squad long overdue for a club that had been known as a club selling players expensively rather than buying. The 2017–18 season was AS Monaco FC's fifth consecutive season in Ligue 1 since promotion from Ligue 2 in 2013. They were the defending Ligue 1 champions and also took part in the Coupe de France, the Coupe de la Ligue, the Trophée des Champions and the UEFA Champions League. The 2017–18 season was Olympique de Marseille's 68th professional season since its creation in 1899 and 22nd consecutive season in the top flight. The club participated in Ligue 1, Coupe de France, Coupe de la Ligue and the UEFA Europa League. The 2017–18 FC Girondins de Bordeaux season is the 137th professional season of the club since its creation in 1881. Bordeaux finished their domestic season in 6th place, qualifying for the UEFA Europa League next season. In the 2011–12 season, Al Sadd SC is competing in the Qatar Stars League for the 39th season, as well as the Emir of Qatar Cup the Crown Prince Cup and the Champions League. The 2017–18 OGC Nice season was the 113th professional season of the club since its creation in 1904. ↑ "Mamadou Hamidou Niang". Turkish Football Federation. Retrieved 16 September 2011. 1 2 "Mamadou Niang". L'Équipe. Retrieved 16 September 2011. ↑ "Niang, votre Olympien du mois de mai". OM.net. 2009-06-07. Retrieved 2018-03-27. ↑ uefa.com (2010-08-14). "Niang leaves OM for Fenerbahçe - UEFA Europa League - News - UEFA.com". UEFA.com. Retrieved 2018-03-27. ↑ "Mamadou Niang Player Profile - ESPN FC". soccernet.espn.go.com. Retrieved 2018-03-27. ↑ "Oyuncumuz Mamadou Niang'ın Katar'ın Al Sadd Kulübüne 7,5 milyon Euro bedelle transferi konusunda anlaşmaya varılmıştır". Fenerbahçe SK (in Turkish). Turkish Public Disclosure System (KAP). 6 September 2011. ↑ "Suwon Samsung Bluewings 0–2 Al Sadd". The Asia Football Confederation. 19 September 2011. ↑ Al Sadd close on final ESPN Soccernet. 19 October 2011. ↑ "Beşiktaş Jimnastik Kulübü". www.bjk.com.tr. Retrieved 2018-03-27. ↑ "Arles-Avignon : Mamadou Niang s'engage pour deux ans - Mercato 365". Mercato 365 (in French). Retrieved 2018-03-27. ↑ "Archived copy". Archived from the original on 28 May 2015. Retrieved 15 February 2015. ↑ "Mamadou Niang". Soccerway. Global Sports Media. Retrieved 16 September 2011. ↑ "M. Niang". worldfootball.net. Retrieved 8 October 2017. ↑ "Mamadou Hamidou Niang - Goals in International Matches". www.rsssf.com. Retrieved 2018-03-27.